Test water to be used for irrigation by a reputable laboratory to determine the quality of the water for irrigation, choice of fertilizers for optimum plant growth, and to minimize the risk of discharging pollutants to surface or ground water. At minimum, test for total alkalinity and soluble salts. Test potential irrigation water prior to new construction. Monthly analysis is recommended for new water sources. Existing greenhouse operations should monitor water quality at least twice a year (summer and winter); more frequent monitoring is needed to alter production practices in response to changes in water quality. 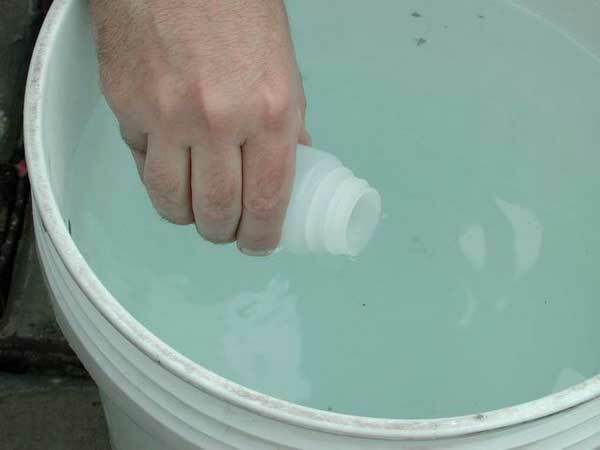 When collecting a water sample, run the water at full flow for five minutes before collecting one pint of water in a tightly sealed plastic bottle. 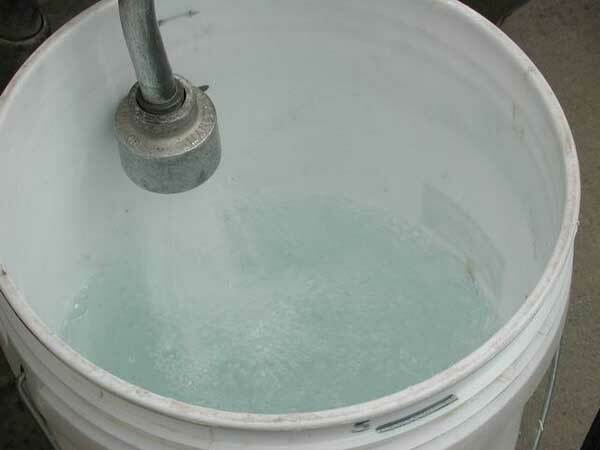 For best results, fill a clean 5 gallon bucket with water and submerge the sample bottle, then seal with the cap under water. Do not use metal lids. The bottle should be totally full with no air space remaining. Prior to new construction, potential irrigation water should be tested. Monthly analysis is recommended for new water sources. Existing greenhouse operations should monitor water quality at least twice a year (summer and winter); more frequent monitoring is needed to alter production practices in response to changes in water quality. Analysis for inorganic elements should include electrical conductivity (soluble salts), pH, alkalinity, nitrate nitrogen, ammonium nitrogen, calcium, magnesium, sodium, potassium, phosphorus, zinc, copper and aluminum. Analysis for biological or disease organisms is not generally recommended since many plant pathogens are always present in water at some level. A list of commercial greenhouse water testing laboratories is available under “Resources” at the end of the document. Electrical conductivity and pH are two characteristics of water quality that can be tested periodically at the growing facility. This helps the grower get an indication of the consistency of the water supply and check the results of treatments to reduce pH or soluble salts. pH meters range from inexpensive pen types to more sophisticated units. It is recommended to purchase one that can be calibrated using calibration solutions. This ensures that the meter is giving correct readings. Electrical conductivity meters are generally more expensive than pH meters. However, they are very useful for testing water quality and media fertilizer levels during crop growth.
. Note: The target range is desirable levels, while acceptable levels are broader. x No expected crop damage under average environmental conditions. Higher rates of macronutrients may lead to undesired plant growth as in the case of plugs. The acceptable limits for trace elements and fluoride are dependent on medium pH. These levels may be too high for growing medium pH less than 5.8.
y Usually depends on the volume of medium and volume of water applied. The medium pH with smaller volumes of media such as with plugs may be stable with 40 to 80 ppm while medium pH in larger pots with higher rates of fertilization may stabilize at 120 to 160 ppm. Note: Levels of NO3 over 10 ppm may indicate a significant level of contamination and health hazard in drinking water. Biernbaum, J.A. 1995. Water Quality. Tips on Growing Bedding Plants. The Ohio Florists’ Association.